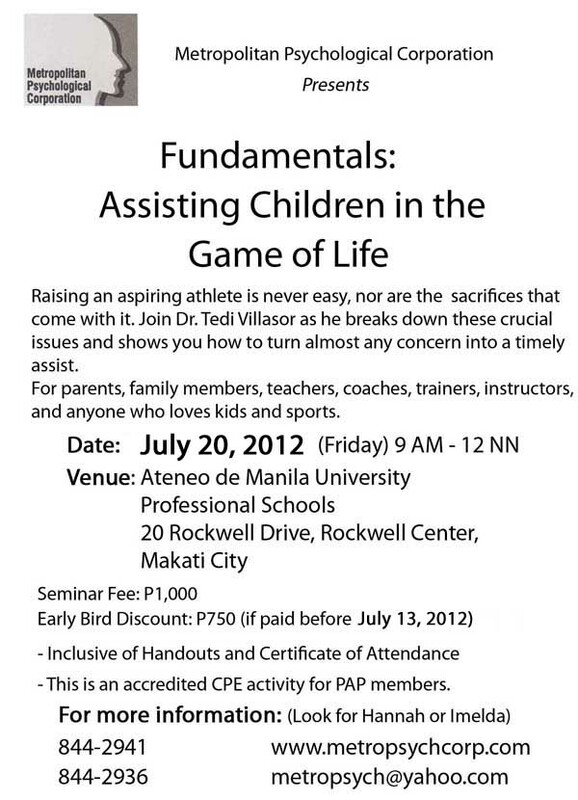 On July 20, 2012, Metropolitan Psychological Corporation (MPC) will be holding its first talk for 2012 entitled, “Fundamental: Assisting Children in the Game of Life” with Dr. Tedi Gustilo Villasor. “Fundamentals: Assisting Children in the Game of Life” is accredited by the Psychological Association of the Philippines (PAP) to issue Continuing Professional Education (CPE) units. 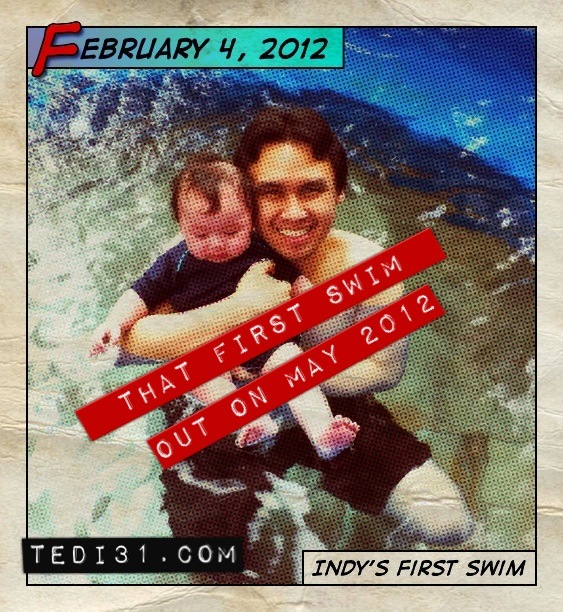 Raising an aspiring athlete is never easy, nor are the sacrifices that come with it. Join Dr. Tedi Villasor as he breaks down these crucial issues and shows you how to turn almost any concern into a timely assist. For parents, family members, teachers, coaches, trainers, instructors, and anyone who loves kids and sports. Look for Anna or Imelda at 8442941 or 8442936. An invitation by De La Salle University-Manila (DLSU) Professor Marybeth Nave to give a career talk to her Personal Effectiveness 2 (PERSEF2) class the other week has allowed me the opportunity to reflect on a number lessons and challenges that I have learned in my academic/professional journey. So far, it’s been an interesting ride and one that I look forward to sharing with the PERSEF2 students. 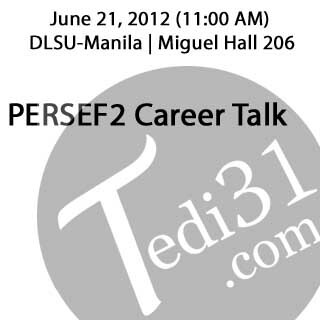 The career talk is set for June 21, 2012 at 11 AM in the DLSU-Manila Brother Miguel Hall 206. The Makati Medical Center College of Nursing (MMCCN) has invited me to give an inspirational message to their freshmen BS Psychology students during their Orientation Program on June 16, 2012 (8:00-10:00 AM) at the Makati Medical Center (MMC) Auditorium. Entitled “Psychtunities,” I will be sharing with students some pointers on how they can best navigate through academic challenges and future career opportunities. 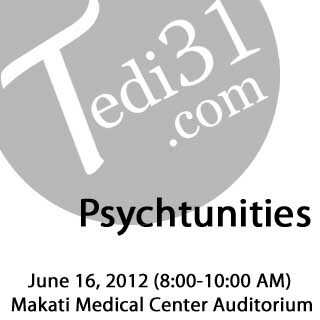 I will also be discussing the critical importance of certification and licensure in Philippine Psychology. 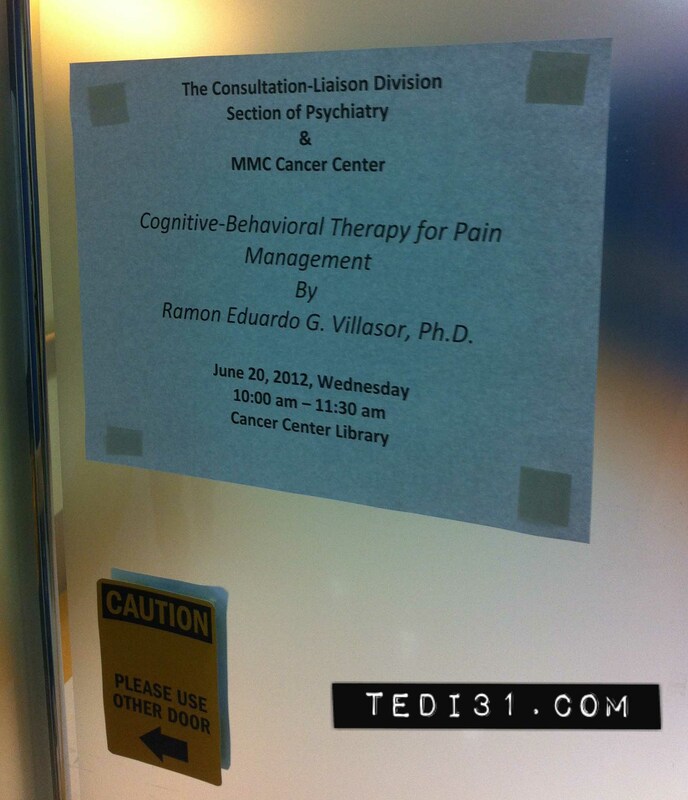 As part of a psychoeducation lecture series, the Makati Medical Center (MMC) Section of Psychiatry and the MMC Cancer Center have invited me to talk on the topic “Cognitive-Behavioral Therapy in Pain Management” on June 20, 2012 (10:00 AM to 11:30 AM). This event will take place at the MMC Cancer Center Conference Room, 1st Floor, Tower I, Makati Medical Center, Makati City.